Visiting Austria’s best Chocolatier was a wonderful experience. 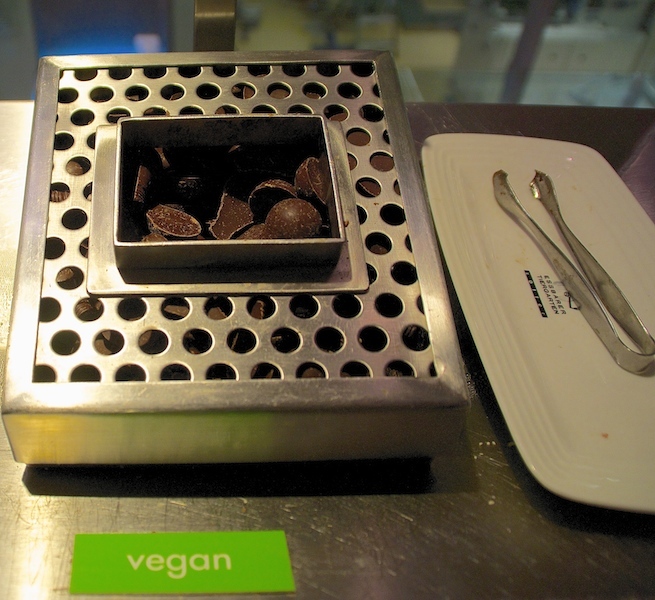 Imagine a place where all your chocolate indulgences are not only permitted but also encouraged. A place where 365 chocolate varieties are waiting for your approval, one for each day of the year. All this with no boundaries, no limitations but your own, when your body finally capitulates and tells you enough, no more! And when you finally decide to follow your body’s great wisdom, you see a bar! You hope it is the alcohol type or any other type but deep down you know you are just in denial. So you try to walk away but then this nice young lady calls you over. She asks if you want to try one of the chocolate cocktails. She tells you there are many tempting flavour combinations. You smile nervously and try to reassure your body you have the will to refuse. But then the chocolate devil whispers in your ear, why not? After all it is just a drink, a chocolate drink but still. It looks light and maybe it is the soothing culmination of a memorable day. And a memorable day it was! 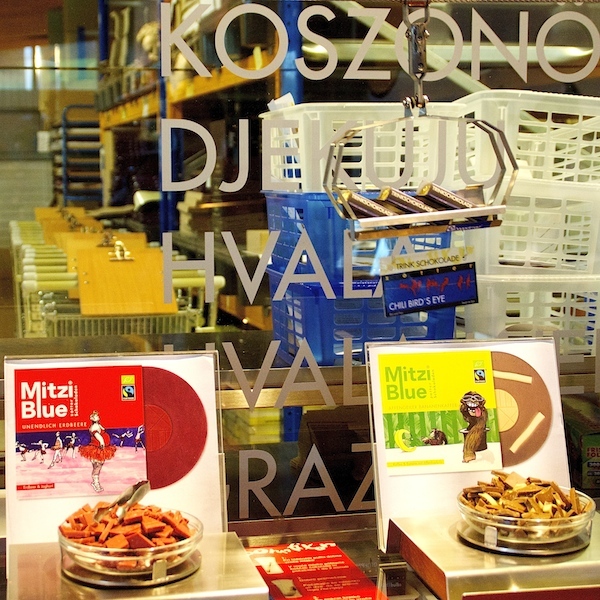 Zotter Chocolatier and his family are another example of the Styrian entrepreneur spirit. Joseph Zotter started out as a chef and pastry chef in several luxury hotels around the world. In 1987 he decided to create a family business in the Styrian capital, Graz. 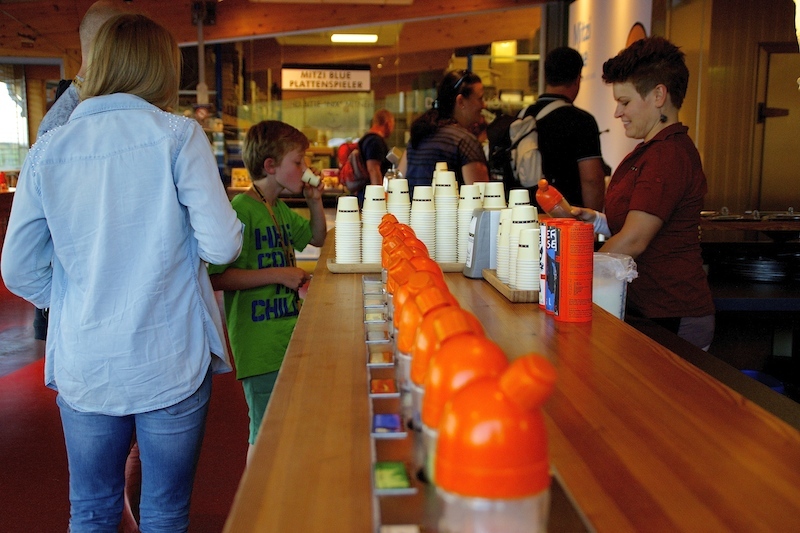 The confectionary shop with its innovative creations gained fame in the region. Soon Zotter expanded by opening three more branches. It 1992 he started experimenting with chocolate in the back room of his first shop. He created new concepts like the layered filling hand-scooped chocolate and new 70 g chocolate bars with flavours inspired by traditional local ingredients. Flavours like Poppy-Cinnamon or Pumpkin Brittle with Marzipan. Two years later, upset by the often brainless side of advertising, Zotter began a lasting association with a local artist. Andreas Gratze started designing original wrappers for his chocolates. Zotter believed consumers should be inspired and what better way than to associate art with the product. This fusion of art and chocolate has become famous and there are even people who after consuming the chocolates keep and collect the wrappers. After his first venture fails and he is forced to close all three shops, Joseph Zotter doesn’t give up. He is determined Chocolate is the future. Together with his wife he creates an artisan chocolate workshop in his parents old barn. There they start experimenting with new flavours. He also starts to travel to countries where the beans are grown to meet the local growers. Witnessing the conditions in which these often small farms produce the cocoa beans and understanding that quality costs but should be rewarded, Joseph Zotter decides to invest in free trade, sustainable, organic cocoa farming. He becomes one of the few bean-to-bar producers in Europe. This means he buys the organic cocoa beans directly from the growers. 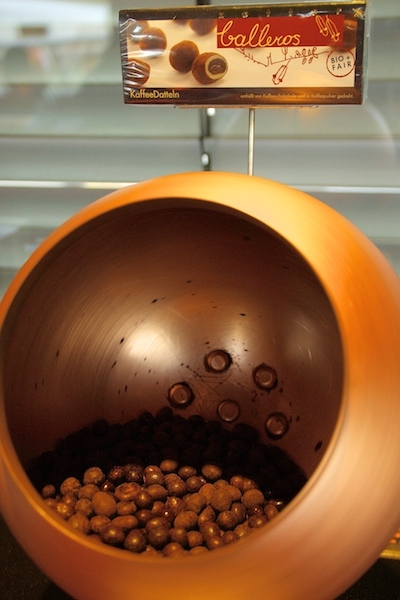 Those beans are then roasted, ground, milled and conched at his manufacture in Styria that employs 160 people. All these processes are explained and shown during the tour. You get to taste and compare for example the freshly roasted cocoa beans from many different countries. 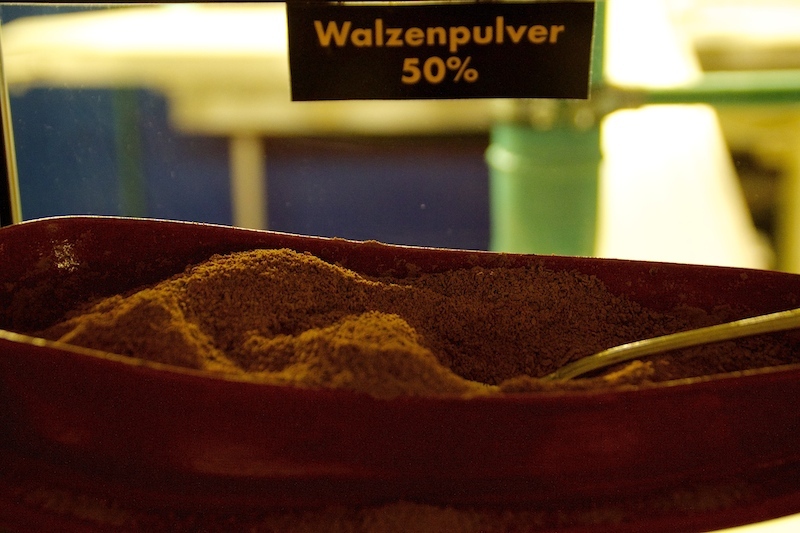 You also get to taste the cocoa squeezing powder with different concentrations. 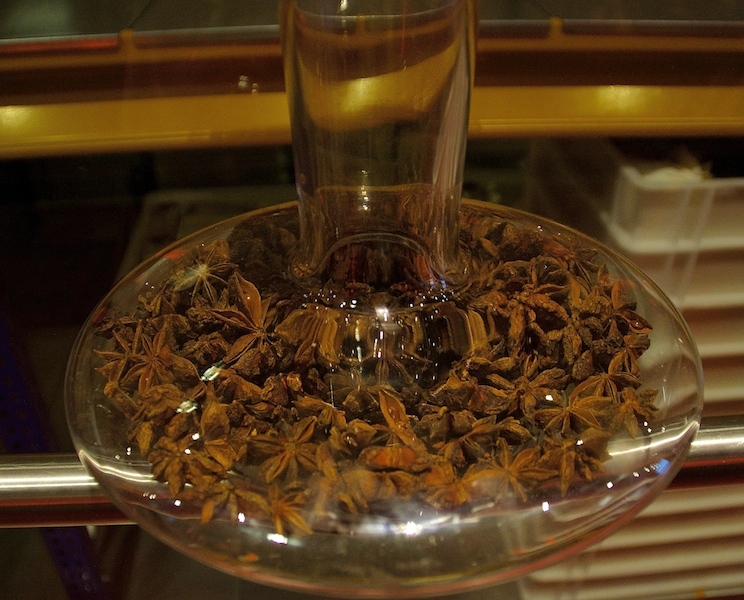 I also enjoyed the “Smelling and Curiosity Cabinet” where you can play the “guess the aroma game” and see some of the ingredients used, like the wonderful star anise. Joseph Zotter is the only one in Europe who produces solely organic and fair-trade quality. Only high quality certified organic beans are used. Those originate from Bolivia, Brasil, Ecuador, Peru, Panama, Nicaragua, Dominican Republic, Congo, India and Papua New-guinea. Zotter prides himself in having a close relationship with all the growers, inviting them often to Austria to visit the Chocolate manufacture. Some had never seen a cocoa manufacture and did not know how the beans were processed after they left their farms. Besides paying above market prices to reward quality and productivity, the Zotter family has also been involved in numerous social projects. These have aimed to increase the growers living conditions and also give them a fair chance to compete with mass production. Thanks to his innovative spirit, vision and craftsmanship Joseph Zotter is now considered one of the best Chocolatiers in the world. What started as a small scale family business has become a global success. His children have become involved in both the creative and business processes. His daughter now lives in China where a new Zotter Chocolate manufacture and boutique have attained great success. His son is responsible for an online ordering tool that offers customers the possibility to create their own favourite custom made chocolate from a range of 99 different ingredients. Having so much variety and limitless chocolate tasting opportunities during the tour can be overwhelming. There is so much to try, sometimes you don’t know which way to turn. After that wonderful Chocolate bar and trying really original blends, I could not resist taking a few home. They have these small individual bars which make the most wonderful hot chocolate. I chose Cardamom which reminded me of the Middle East where I also lived. This blend of milk chocolate and sweet coffee coating with the Cardamom flavour transported me to Saudi Arabia and their Cardamom flavored coffee. They say you can make it in two ways. What they call the trendy way, consists on filling a “Zotter shaker” with warm milk, drop the bar inside, give it a good shake and voilá! The slow, classical way is more my style. You warm about 200 to 300 ml of milk and let it froth. Then you drop the bar inside and let it melt one or two minutes before you whisk it. 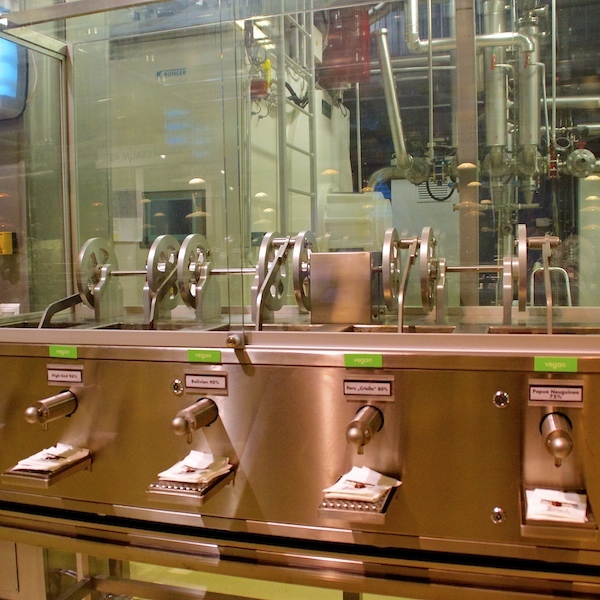 You wait one or two minutes more to allow the aromas to fully develop and then you whisk it a final time. 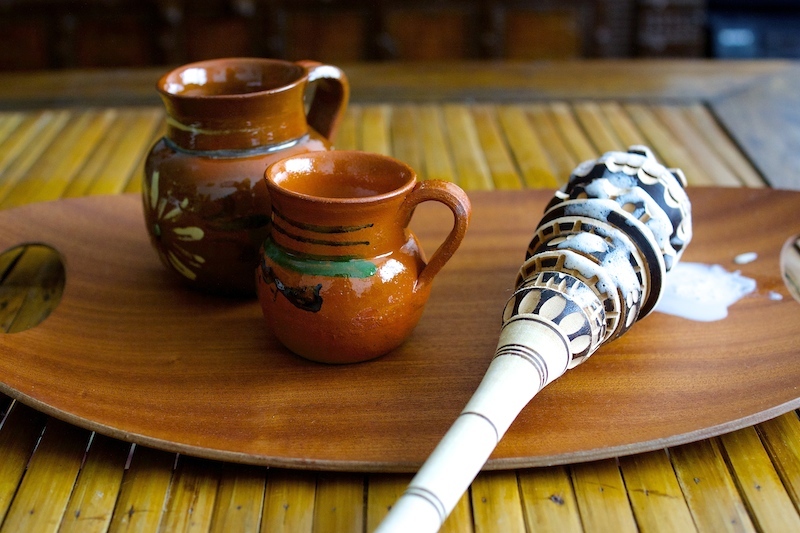 That is when my wonderful Mexican molinillo came into play to whisk it to perfection. 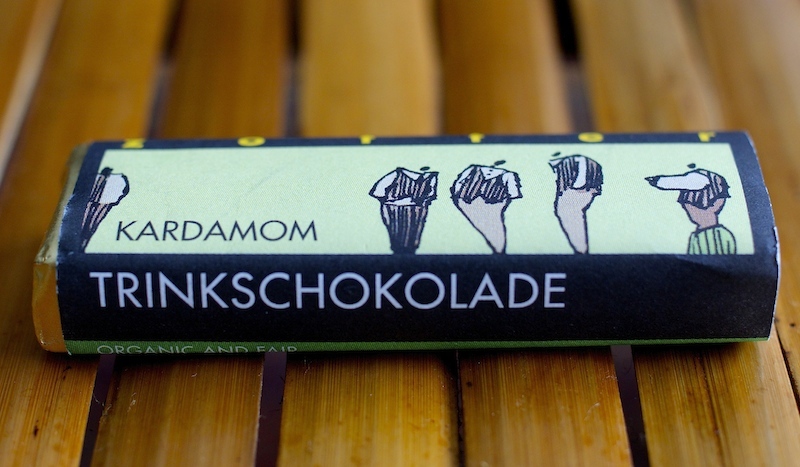 I just loved the richness and flavour of Cardamom bar and I’m thankful for all the good memories that it brought me. I could not finish before I also mention Zotter’s concern with the environment. The entire production runs on ecological power. 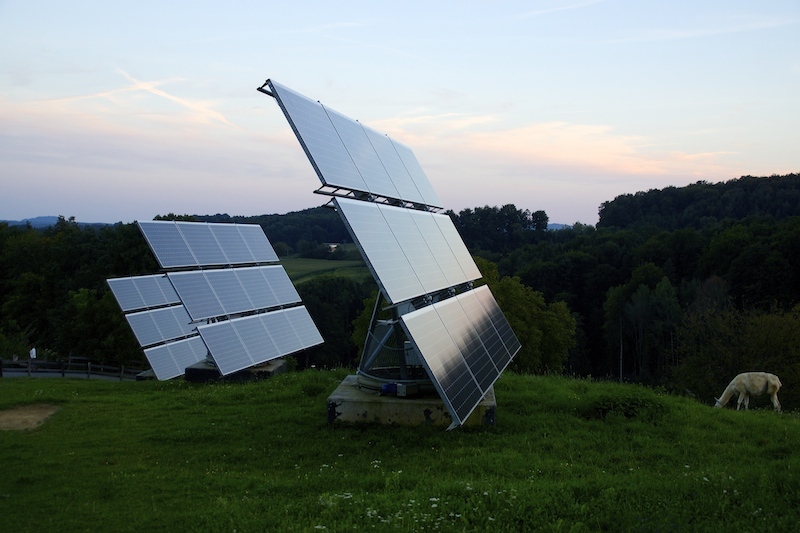 They have solar and geothermal energy which provides them with enough power for their farm and chocolate manufacture. The company is also converting all its vehicle fleet into electrical cars. Included in the Chocolate tour is also the Edible Zoo Tour which gets children closer to the farm animals and gives them the opportunity to taste the organic produce of the farm. Their employees are provided with healthy organic meals everyday and you can also taste it at their restaurant which is where we ended up after dark. 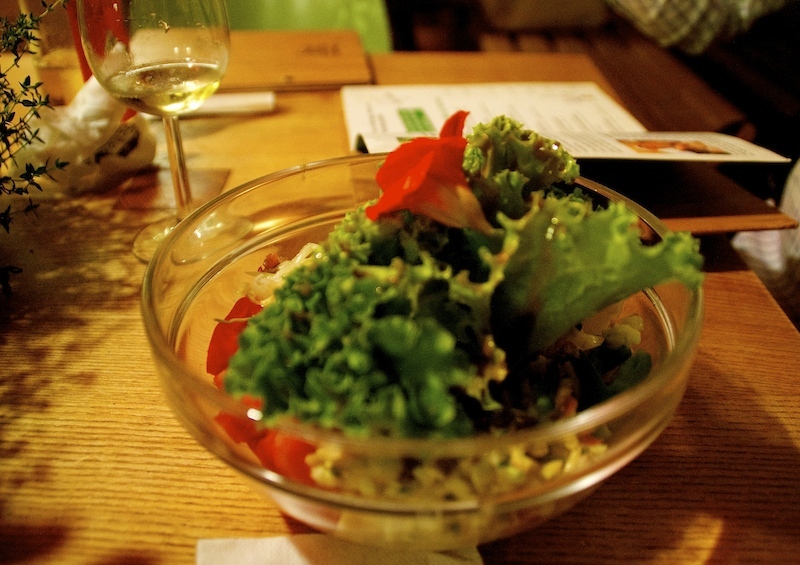 The food was really fresh and light, a welcoming end for a very indulging day. Whether you live here or are here on a holiday, visiting Zotter Chocolate Manufacture in Riegersburg is something I highly recommend. Just remember there may be side effects like chocolate addiction, weight fluctuation and sugar rush! If you have children try to contain their enthusiasm as there is so much to try. I tried to restrain as much as possible my 5 year old daughter and even so she couldn’t sleep very well. Too much chocolate! 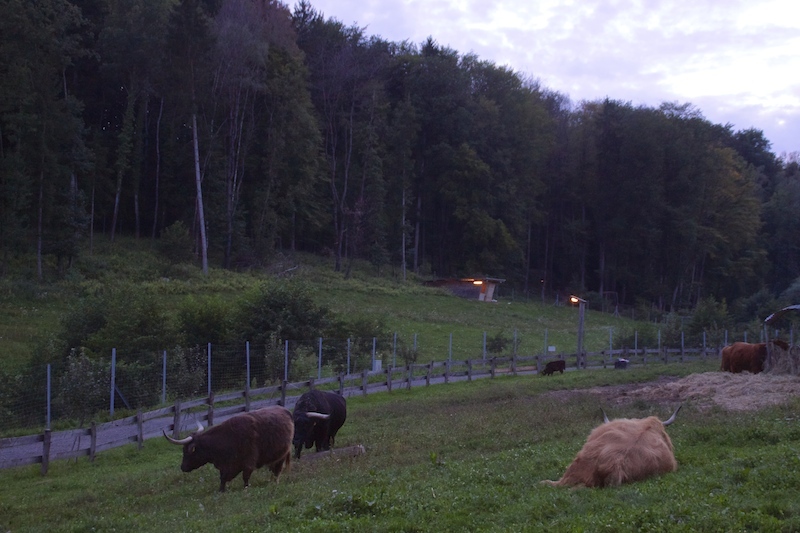 It is really worth a visit Ado and Styria is a very special place. Thank you for your continuing support. It is my place, I am happy you did not take us there, if not I could have remained forever. I can see Alexander and my chiquilina there. Remember that people who like chocolate don’t suffer depression.